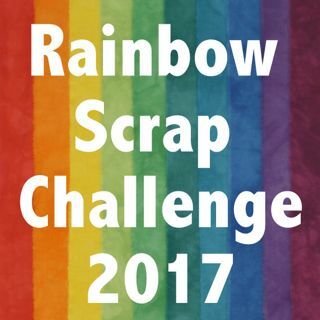 What have I been doing? 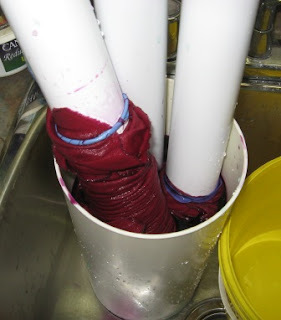 I have been doing more fabric dying again. I have a sales booth at the Edmonton and District Quilt show next week end. I needed to get more fabric ready for my booth. These first two photos are Fat Quarters rapped on poles and dyed. Sorry it went side ways. 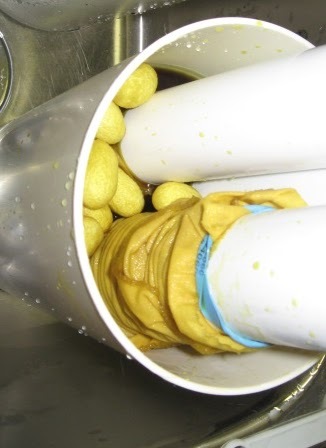 The Yellow things in the dye pot are silk cocoons. I am dying a fiber kit. More on them another day. I like to dye them all twice to get a cross over of colour. 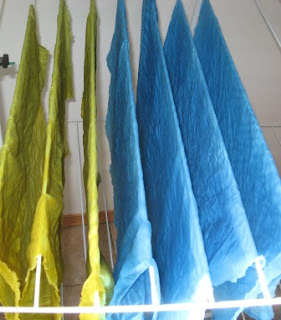 I find it easiest to rap the fabric dry, so between dying, I rise them and hang to dry. Them only when I like what I have I do a finally wash in the machine with hot water and soap. The fabric is now being ironed by my mom so it looks good. I will have to update you on the great stack of pole rapped and dyed fabric soon.